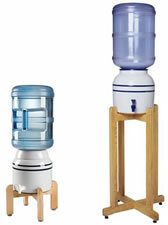 Porcelain Water Crock Dispenser - Great Gift Ideas. • Holds 3 or 5 Gallons of Water. Supports Standard 2, 3, or 5 Gallon Bottles. • Water Crock has 2 blue, green or black rings around it. IMPORTANT: Wooden stand and bottle are NOT included.